Easy to use authoring tool to collect, store, organise and publish information. Washington. June 24th, 2009. - vetafab Software is releasing a new version of it's Windows application lexiCan. According to the developer, the upgrade improves productivity and collaboration. 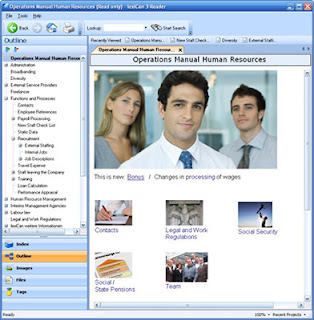 Individuals and teams use lexiCan to manage information and knowledge for projects, in business management, research and idea gathering. The developer is also introducing a new read only client lexiCan Reader, which allows users to publish content such as guides, manuals, references, support data bases, knowledge bases within a network with one click, making publishing as easy as editing. The software remains simple, no special training is required. Similar to a personal Wikipedia, lexiCan allows users to build articles using texts, pictures, tables, links to websites and files. Using the title as a reference, articles can be accessed in seconds even in voluminous collections, overcoming the daily burden of clicking through folder hierarchies as done in Windows Explorer. Unlike Wikipedia, lexiCan purely works as a desktop application based on Microsoft .NET framework, enabling user convenience, such as setting links per drag and drop or dropping emails from Outlook into a description. lexiCan features full text search that includes embedded files. The developer points at several other intuitive retrieval features, like an automated view on pictures, embedded files and tags. Articles can have multiple tags which lexiCan displays as a list or clout. The article tree can be structured in the application's Outline section. Günther Eufinger, Managing Director of vetafab Software GmbH, says about lexiCan: "Scientists organise research projects and research material; students structure material collections, essays and gather excerpts; project managers compile manuals and glossaries; journalists, authors and other creative minds implement lexiCan for their concepts and idea gathering; consultants use it to accumulate information and to document projects. We are so confident that people will use lexiCan extensively, that we are giving away free versions for up to 30 articles per project, with no time limit, no advertising and all functions included." lexiCan 3.0 collects knowledge in individual articles, linking topics and embeds them in a navigation hierarchy, structuring the different knowledge fields. Mr Eufinger adds: "The free application is the opportunity to end data chaos, and to quickly and easily create a professional knowledge network." lexiCan is a tool designed to link and organise data files (text, image, etc) in topics and knowledge areas. The developer's of lexiCan point out, that the application's information organisation and retrieval ability saves the user time and money, at home as well as in business. The latest lexiCan upgrade improves collaboration among lexiCan users. The application now allows to share knowledge fields on demand and reintegrate subjects. The inclusion of additional data formats make importing, exporting and adding or sharing knowledge content more flexible. "As lexiCan's user base in business is growing", states Günther Eufinger, "we worked on making teamwork effortless." The screen view can now be zoomed freely, to improve the viewing experience when used in presentations with a projector. The new read only client "lexiCan Reader" allows knowledge distribution across a company network, e.g. instructions, course material, faqs, manuals. lexiCan is available for Windows 98, ME, 2000, XP and Vista. The standard edition for up to 30 articles per project is available as a free download from www.lexican.net and can be used with no time limit (no personal data required, no advertising). The lexiCan Pro Edition license can be acquired online for US$ 49.90.
lexiCan is an innovative knowledge management software developed by vetafab Software GmbH of Darmstadt, Germany. The application is a tool for collecting large amounts of information about particular issues for projects in the form of knowledge networks, to structure the information, set knowledge links, bookmarks and evaluate articles to make a body of knowledge more usable and useful. The first version of lexiCan was launched in Germany in 2006 and is expanding globally. Thousands of people use lexiCan in different ways and for different reasons - for project documentation, writing manuals or for internal knowledge management in companies and other purposes. IITM.info is a specialist agency and will be delighted to arrange samples, software for cover mounting or interviews (for example with vetafab co-founder Günther Eufinger). IITM will happily provide image material and background information. Catalina Martínez, Head of International Communication. Online poster and canvas services will usually only print the customer’s image. FotoInsight is launching its new “Deco Shop”, where a matching, natural wood frame can be combined with a mounted canvas or laminated poster. Large format prints from own digital photographs will then be delivered mounted and framed, ready to decorate the wall at home or in an office. Paris and Dublin. 24 June 2009. – The resolution of digital cameras is rising constantly. Many digital photographs could impress at home or in an office meeting room, when printed as a laminated poster or a stretched canvas in a floating frame. With the right image it makes a worthy present. FotoInsight, a specialist serving amateur and professional photographers alike, prints canvases in different sizes from 20x30 cm (minimum resolution 800 x 1100 pixel) to 60x80 cm (2500 x 3300 pixel recommended). FotoInsight states that it uses man made optimised fibres and fade-resistant "archival" inks to guarantee longevity and brilliant colours. The hi-tech inks penetrate deep into the fabric and can therefore be printed and mounted over the edges of the wooden frame. Standardised sizes allow a largely automatic production process. According to FotoInsight this ensures constant quality and long durability at lower prices for the first time. 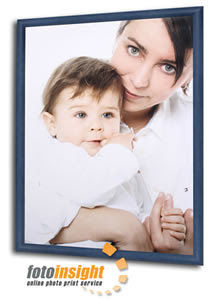 While a photo canvas will be stretched over a wooden frame, FotoInsight can also mount posters onto a "Deco-block“, specially made to hang the laminated and framed posters straight onto a wall. The so called Deco-block was originally developed to hang art prints. It simulates the wood frame used to stretch a canvas. FotoInsight laminates the poster prints onto the block and then seals the surface with a layer of matt UV-protection varnish. The sealed surface warrants a much improved humidity and UV-resistance. The website provides a preview of the poster to help choose among a range of Nielsen wood frames. Framed poster and canvas prints elevate holiday snaps to impressive works of art. The fine structure of a canvas lends an artistic impression and adds depth when stretched over a 1/2“ deep frame. A large, framed photo print becomes a unique piece of art and an ideal present, most appropriate to decorate a home or an imposing office space. Photo canvas printing is also well suited for digital art created with image editing software tools and filters. FotoInsight's Managing Director Klaas Brumann states: "The traditional canvas print has received a completely new importance. At FotoInsight we offer the high print quality for impressive prints.“ Unlike a poster behind a glass frame a canvas print, with its fine structure looks thorough and avoids reflections. "Quality is our priority. All materials we use are subject to extensive testing and are guaranteed by their manufacturers to last 100 years. This guarantee extends to poster printing on real photographic paper as well as to the canvas print", emphasises Dr. Rolf Hollander, CEO of FotoInsight's production partner and Europe's largest photo finisher. Ordering framed prints in FotoInsight's Deco Shop is as easy as with traditional photographic prints, poster or photo books. A clearly structured overview of formats and costs with their respective recommended resolution come together with a user friendly interface at http://www.photo-canvas-printing.com/ . FotoInsight’s Head of Communications states: “The mounted canvas print is an ideal present. And the collage photo poster feature is a great addition for families.” The hi-tech production processes enable FotoInsight to provide the framed laminated poster prints from €21.99 (postage & packaging from €12.95) – prices well below of what used to be expected from framed prints, make it an ideal present. FotoInsight Ltd was founded in 2003 in Cambridge and runs an easy to use digital photo processing service, offering an extensive array of award-winning photographic print and gift items as well as the photo books, photo posters, photographic calendars and photos on canvas printing. Customers benefit from patented development processes and the experience of Europe’s largest independent photo lab with an installed capacity of 18 million prints per day. Photos ordered through http://fotoinsight.com are developed in one of 16 strategically located, state of the art photo labs, employing 3000 staff, with an output of over 3 billion prints per year.